For this installment, a couple heads to Sicily for a 5-turned-6-night vacation. Note: All costs have been converted from Euro to USD. 11:45 a.m. The one thing we’ve learned so far on this Italian adventure is that life definitely move a little slower here than it does back in America. After a long line at the car rental agency, we’re on the road and headed to our first stop, Villa Giardinata, a B&B outside of Trapani on the northwestern side of Sicily. 1:45 p.m. We finally arrive at our B&B, where an innkeeper greets us and serves us orange juice. While we struggle a bit with the language barrier, we delight in a tour of the grounds and the antique-filled property. 8:00 p.m. Getting up at 4 a.m. is starting to really hit us, so we decide to call it an early night and head back to the B&B for much needed rest. 8:00 a.m. We kept our itinerary pretty loose so that we could feel out the island before committing to any activity. Because of this, the Marsala wine tour we hoped to do is sold out. Instead, we head south to Agrigento to see the Valley of the Temples, a park full of ancient Greek ruins. It’s going to be a long day of driving, but at least the Instagram pictures will be great. 1:30 p.m. We find a small path from the road and start to descend. We soon realize this path is incredibly steep and slippery, and while we’ve passed a few hikers, it’s pretty deserted for a such a large tourist attraction. Nonetheless, we continue on, and after a few necessary panic attacks we finally see the rippled white dunes and water below. We somehow missed the stairs on the other side that takes you directly down to the beach. Oops! Cost: Nearly our lives. 7:00 p.m. Sicily doesn’t play around when it comes to ruins. The Valley of the Temples is a sprawling site that includes seven temples built around 5th century BC by the Greeks. We get to the beautiful Temple of Concordia right at sunset, which makes for some pretty amazing photos. I don’t remember the last time I’ve been this tired, but I can sleep when I’m dead, eh? After a long trek (at least I’m killing it on that step goal) back to the car, we decide we need food and we need it fast. 8:00 a.m. We wake up and scarf down the free breakfast at the B&B and hop in the car to drive to Trapani. We really want to head to Favignana, the largest of the Aegadian Islands off the western coast of Sicily. One teeny, tiny problem: every ferry is sold out. Maybe we can get lucky if we go beg a ticket agent in person. 1:00 p.m. The hydrofoil is an incredibly quick (an incredibly nauseating) ride. We stand by the door as we approach the island, gunning to be the first ones to buy our return tickets. 3:00 p.m. I really, really love Favignana already. So many charming streets, beautiful coves and secluded, crystal clear beaches. Since so many people ride bikes or scooters, there are few cars on the road. After an hour or so of mindless riding, we land at Cala Rossa, a rocky beach area with water clearer than New York City tap. 6:00 p.m. A few hours of riding around later, and we’ve covered about half the island. We’ll definitely have to make a trip back someday. 7:30 p.m. Our ferry departs and we watch the lights of Favignana from the window. This beautiful island is undeniably my favorite part of Italy so far. 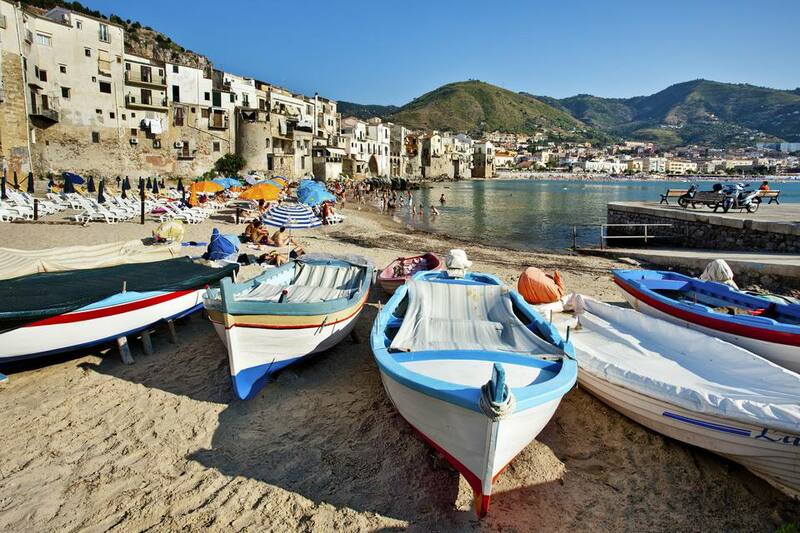 9:00 a.m. Today we’re driving east to our last stop in Sicily, a popular seaside resort town called Cefalu. I pinned so many photos of beautiful Cefalu before our trip, so my expectations are high. We eat the free breakfast our B&B and bid our kind hostess goodbye. 4:00 p.m. We decided to pop back to the hotel to rest before heading out to dinner. Our hotel, Baia del Capitano, has a great pool and garden area, so I take a nap in the sun. 9:30 p.m. A quick stroll by the water later, we’re ready for bed. I can’t believe we only have one full day left in Italy. 10:00 a.m. Since Cefalu is a relatively small town and we covered a lot of ground yesterday, we decide to spend the morning by the pool. The free hotel breakfast tides us over until we make our way into town. 11:00 p.m. Back home and already dreading our flight tomorrow. 9:40 a.m. After a quick breakfast at the hotel, we check out and head to Palermo airport. Our flight is at 12:45 p.m., but traffic is really, really bad. Panic sets in. 11:00 p.m. Whew! We make it past the gridlocked traffic and to the airport in time. We’re a little frantic, and as we approach the gate we’re not quite sure we’re reading the information sign correctly. Canceled? What? Oh, no. 4:00 p.m. The hotel the airline paid for is Citta del Mare, a resort known primarily for its slide that goes directly into the ocean. Our room is a good 30-minute walk from check-in and it’s pretty rundown and dirty. But its free and we’re trying to make the best of it, so we quickly change into our suits and head to the bar for a late lunch. 9:00 p.m. Somehow there’s no Wi-Fi anywhere in the hotel except on a children’s playground that’s loudly blasting The Little Mermaid soundtrack in Italian. Since I have a bit of work to finish up before our flight tomorrow, I become the oldest person on this Sicilian playground. Things are getting weird. 10:00 p.m. An hour of “In fondo al mar” (better known in the U.S. as Under the Sea) is all I can take so I retire to the room and set my alarm for our 6 a.m. flight. 6:00 a.m. The flight to Naples is thankfully uneventful. We arrive in Naples with 5 hours to kill until our next flight. 12:30 p.m. Our plane is here and ready for boarding! While I will desperately miss Italy, I cannot wait to get home to my warm bed and indulge in Pad Thai and Netflix. Until next time, Italy!